Converse is a way of life, and to hit that point home, the shoe maker has been helping artists make new music and videos through their Rubber Tracks series. Described as “a global family of community-based professional recording studios” that allows emerging musicians of all genres to get free studio time, the project has turned out some great music and videos. In 2013, it brought us the song “Barefoot” by Smokey Robotic. Smokey Robotic is a music group that is made up of members Father Dude, Konrad OldMoney, Seer, and Illmatic, who you may know as a producer for acts such as Kanye West, Ariana Grande, Lin-Manuel Miranda, J.Cole, Drake, and 50 Cent among others. “Barefoot” is a hip-hop song that is very fast paced. The drums are rapid fire and the piano riff keeps the tension ramped up. Seer’s rhymes are rapid fire and delivered on point throughout. The lyrics talk about not feeling comfortable in your own skin as the chorus says that “if the suit don’t fit, why would I have it on? I take mine off and keep moving on.” This is where the “Barefoot” metaphor comes from, as you walk alone and naked through the world. Seer uses this to then ask a girl to come with him on his journey. The song never lets up, and both Dude and Seer perform their parts very well. Walking up to the final painting. The video takes place at some sort of art presentation with Seer and Father Dude being front and center. This setting fits with the lyrics as Seer references paintings in his verses. 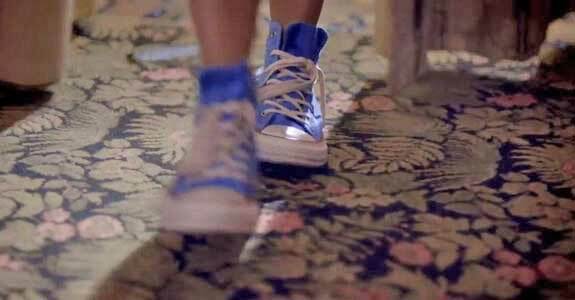 Throughout the video, we see a woman wearing a blue dress with a pair of blue chucks as she makes her way through the gallery taking pictures out of their frames and putting them into her handbag. When she gets to the final painting, she is engulfed by it leaving her covered in different colors and disoriented. She finds Sheer and Dude and they lead her to black canvas. She touches it and becomes the painting. It’s a very different and interesting video. It also very much fits the fast-paced song.